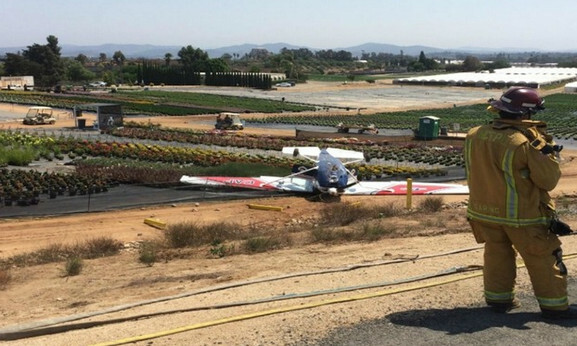 A small plane coming in for a landing at the Fallbrook Air Park ran out of runway and made a left, causing the plane to roll over, officials said. The Cessna 182, a part of the Civil Air Patrol, [California Wing] landed shortly after 1 p.m. Wednesday at the air park, located at 2155 S Mission Road. The Civil Air Patrol is the longtime all-volunteer U.S. Air Force auxiliary. The aircraft suffered “substantial damage”, Federal Aviation Administration (FAA) spokesman Ian Gregor said. 7 Comments on "Elderly CAP Pilots Flip Plane"
You guys haven’t reported this yet. He took off in heavy rain and thick fog from an uncontrolled field. Carl Morrison, they will lionize him first before the truth comes out. This AuxBeacon “aggregation story” checks true. The upside down Civil Air Patrol Cessna 182 is not photo-shopped and can be found at other media news outlets. Yet, this article was prepared and delivered by ABC TV 10 News. The Rhode Island Wing has been in a downward spiral since April of 2014. Mass Exodus of Pilots seniors and Cadets immediately upon the new Command Staff taking power. Each complaint made by members was ignored by nhq. Now we have a Rhode Island state police investigation into the wing vice commander. CAP commanders use the program to pad their resumes and climb business and social ladders with mess dress photo-ops. “Findings” that prevent their advancement must be concealed through subtle hints, pass-overs for promotions and, if necessary, commander power of Membership Termination or the CAPF[orm] 2B. Dishonest behavior is encouraged from the top down and “groomed” commanders use techniques to protect and advance their bosses, even at the expense of safety. Good people leave and the holes are re-filled with unqualified but politically cooperative cronies. This is CAP in a Graveyard spiral.